I have been invited to visit Uruguay on numerous occasions in the past, but this Spring a family member was having a significant birthday which catalysed my trip. Most people have no idea where Uruguay is, it is a small country by South American standards, sandwiched between the power house economies of Brazil and Argentina. It has no indigenous motor manufacturer, cars have been imported, which has made them an expensive item. As a result people retain cars longer and strive to keep them running. The majority of cars on the road look well worn and far from original, but even the most battered are still far from being rusting hulks. You see plenty of familiar designs from the 1960s right through to the 1990s, as if trapped in a time warp or a giant classic car show. Chunky angular saloon cars, estates and utility pick-up trucks outnumber the hatchbacks and sports cars are a very rare sight indeed. The most numerous Opel models, were the Rekord E series and an unusual model variant of the Kadett / Chevette. The centre tub of the car is instantly recognisable, but the front are rear ends are a bizarre mix of parts that appear to be borrowed from the early Vauxhall Nova. It looks like a product from a parallel universe, where the rear wheel drive Kadett C series had evolved into a new vehicle and maintained the rear wheel drive era for another decade. Uruguayan Chevrolet Chevette - how the Kadett C might have evolved? Other notable non-GM vehicles included; the Peugeot 504, some in sparkling condition, huge ancient gnarly Ford pick-ups and plenty of VW Beetles, produced in neighbouring Brazil. 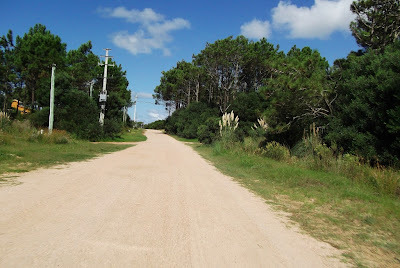 Uruguay has modern tolled motorways, but the small provincial towns are served by arterial roads that are dirt tracks, well maintained in places, but still dirt tracks. It was a novelty to be driving for over 100 miles at around 60 mph on these dirt roads. Ironically I had a similar experience earlier in the year driving a similar distance whilst heading to Geneva on roads covered in fresh snow. Our hire car was a Chevrolet Corsa, much like the UK Corsa, but with a boot. Looking underneath I noticed that the suspension control arms have skid plates fitted, possibly a concession to rough off-road driving that prevails.